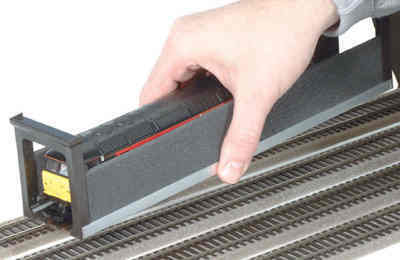 Recommended price £13.95 A multi use item designed to sit on the track so that you drive your loco onto the unit and then lift the loco up using the foam sides without actually touching the loco by hand. You can then turn the loco and replace it back on the track if you have no turntable, or you can use the lift as a storage cassette. Multiple lifts can be stored one on top of another.